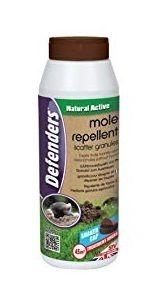 Mole Repellent Scatter Granules provide a chemical free, eco friendly method of garden mole pest control. Easy to use, simply scatter the granules around mole hills or where mole tunnel runs are located, to effectively repel, deter, stop and get rid of nuisance garden moles. These Mole Repellent Scatter Granules are biodegradable crystals coated with castor oil making them totally natural and organic for use in the vegetable plot.